Brand New Ag-Maxx Model TGG48R, 48" 3 Point Mounted Rotor Tiller. This Tiller is GEAR DRIVEN with a Single Speed Heavy Duty Gear Box!!! THESE ARE EXTREMELY HIGH QUALITY TILLERS WITH GREAT FEATURES & EVEN BETTER PRICES!!! * Rated for 20 to 35HP Tractors with Category 1, 3-Point hitches. * Compatible with Cat. 1 Quick Hitches. * This Rotor Tiller has a Slip-Clutch protected Driveline. * This 48" Model Comes with a Built in Off-set feature (3.75") to help cover Tire Tracks. * Has 36 "L" Shaped Heat Treated Tines with Six Blades per Flange. * Adjustable Skid Shoes are included. 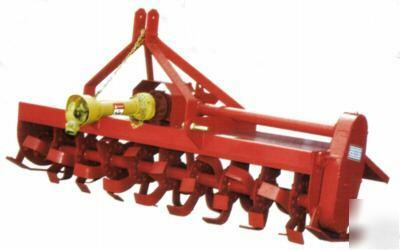 * Tiller has a Maximum Tilling depth of 8". * Tiller Comes Complete & Ready To Use, including a 540 RPM PTO Shaft! Plus, we are glad to say that Ag-Maxx Products are MADE IN THE USA!